Ron Boyd heads out for his first and perhaps only deep-sea fishing trip aboard the Stardust on Tuesday. Before heading out of Santa Barbara Harbor aboard the Stardust sport-fishing boat early Tuesday, the closest Ron Boyd got to the ocean was the water’s edge. The Tonopah, Ariz., resident loves lake fishing and did that for years. Now he’s fished the deep sea – a first that may well be his last. Mr. Boyd, 55, is in the advanced stage of chronic obstructive pulmonary disease and has about six months to live. He can’t work, is of limited means and recently moved in with a hospice caretaker. Tuesday’s trip out of Sea Landing aboard Capt. 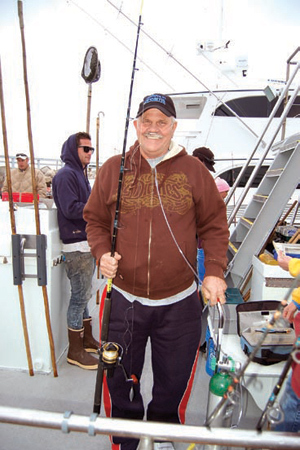 Jason Diamond’s popular fishing vessel was, for Mr. Boyd, a wish fulfilled, all thanks to the Dream Foundation, which grants the wishes of adults suffering life-threatening illness. Mr. Boyd is at the point in his illness where medicine can do no more. Like others with COPD, he suffers from chronic bronchitis and emphysema, the latter of which destroys the lungs. Cigarettes, he said, have definitely been a contributing factor. With the end near, Mr. Boyd came up with a “bucket list,” and right at the top was a fishing trip just like the one he was setting out on this cold, gray morning. Hospice workers reached out to the Dream Foundation, which, through its various supporters, made it happen. The fishing trip was actually one of several sea-theme activities that Mr. Boyd and his caretaker, Cathy Newport, have taken part in over the past few days. On Monday, they rode Santa Barbara Land and Sea Tours’ Land Shark around town, and today they plan to tour a halibut and abalone farm at the private Dos Pueblos Ranch, feasting on fresh seafood and avocados prepared on-site by chef Jason Banks. Other supporters making this dream come true are Eagle Inn and Chuck’s Steak House. Going on the ocean is one thing. But for many, keeping everything down once there is a different matter altogether. So, with six hours on the Pacific ahead of him, you couldn’t help but wonder whether landlubber Mr. Boyd was afraid of getting seasick. Ms. Newport was nothing but smiles as they prepared for the day at sea. “This means the world to me because I know it means the world to him,” she said. For Capt. Diamond, helping out those in need is second nature. As the crew untied the vessel and prepared the Stardust for launch, Mr. Boyd gave his rod the once over. What was he hoping to catch? Arriving back to the dock just after 3 p.m., Mr. Boyd marveled at the experience. And how was the fishing? “I got seven or eight fish,” he said, noting there was one parrot fish and the rest were red snapper.